The Mystic Krewe will be hosting a CPR certification class, Tuesday, January 17 in Metairie at 7pm. If you are interested in attending and obtaining your formal CPR certification, use the form below to register. CPR stands for cardiopulmonary resuscitation, and is an emergency procedure combining rescue breathing and chest compressions in an effort to reverse cardiac arrest. 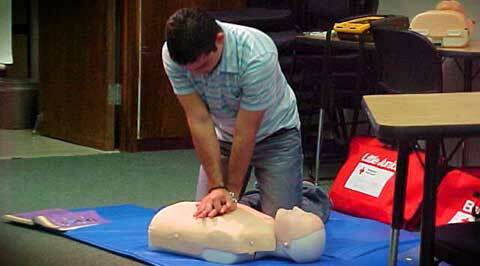 CPR is a method to reactivate the heart in pumping blood through the body. While cardiopulmonary resuscitation is not likely to restart the heart, its purpose is to generate oxygenated blood to vital organs, most importantly the brain. If cardiopulmonary resuscitation is successful, it provides temporary relief to vital organs and body parts, thereby decreasing the likelihood of brain damage or death. In general, CPR is only effective on a victim of cardiac arrest if commenced within 6-7 minutes after cessation of blood flow through the body. It is important for members of the community to become certified in order to perform the chest compression and mouth-to-mouth techniques in case of an emergency. While cardiopulmonary resuscitation is not always effective, it buys time before the paramedics arrive to perform electric shock defibrillation on the heart. Nearly every community offers classes or certification programs through administrative departments, such as police or fire departments. Learning CPR can save lives. People die every day from cardiac arrest, due to drowning, smoke inhalation, and many other causes because family members, friends, and bystanders don’t know how to respond effectively in order to reactive blood flow to prevent brain damage or death. Cardiopulmonary resuscitation is easy to learn, and classes are available all over the United States to instruct people how to deal with cardiac arrest and/or ceased breathing. Simple maneuvers, such as chest compressions of about 100 per minute and mouth-to-mouth resuscitation (where the emergency assistant simply breathes small amounts of air into the victim’s mouth), can aid in saving in many lives. Registration is now closed. Contact a club member for access information.